The storyline of J.J. Abrams’ Star Wars: Episode VII may be top secret, but its first casualty has already been revealed: as previously reported, actor Harrison Ford hurt his ankle last week while filming. 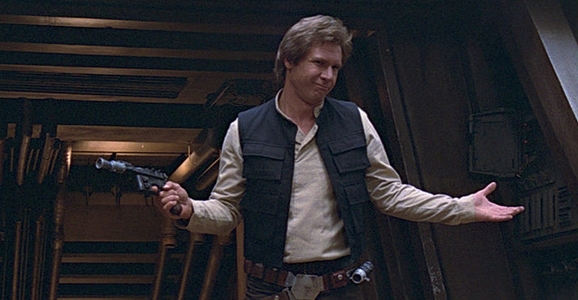 According to The Hollywood Reporter, the 71-year-old Ford’s injury involved one of the doors on the Millennium Falcon. At the time it was reported, Ford had been taken to the hospital to get checked out, and the official statement added that “Shooting [on Episode VII will continue as planned while he recuperates.” Well, it turns out that ankle injury is a bit more serious than initially thought, and now we’re left wondering how that could affect Episode VII’s shooting schedule. Access Hollywood spoke to Harrison’s son, Ben Ford, who revealed that Harrison may require surgery on the ankle, possibly involving the installation of a metal plate and screws. That sounds like the sort of thing that’s going to involve some bed rest before Ford is up to full speed again. The Mirror claims, via an unnamed source, that Ford could be down for the count for six to eight weeks. It’s the Mirror, so taking that with a grain of salt would probably be wise, but it doesn’t sound inconsistent with the other information. Ben Ford has speculated that his father would still be able to continue filming, but that they just might have to limit him to waist-up shots until the ankle is all healed up. Screw that noise, this is science fiction: somebody get that man a Professor X hoverchair! Or at least a bacta tank. It’s really difficult not to run a sensationalist headline that reads something like, “OMG, J.J. Abrams Tries To Rip Han Solo’s Foot Off On The Set Of Star Wars: Episode VII!! !” That sounds like a great deal of fun, but my more responsible side won out in this instance. 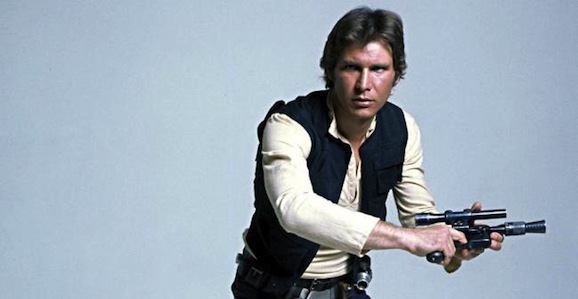 The situation doesn’t appear to be all that serious, but Harrison Ford did in fact sprain his ankle while filming, and was taken to the hospital to get checked out and heal as necessary. A bunch of bite sized Star Wars news nuggets have dropped today. Taken on their own, none of them are the most Earth-shattering things you’ve ever heard—though one is rather significant—but the impact does cut a wide swath across that galaxy far, far away. First up is a photo from the set of the much talked about Star Wars: Episode VII. 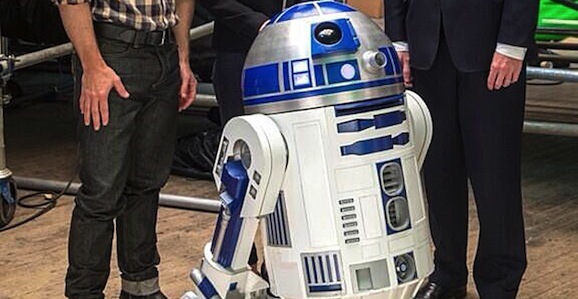 Tweeted by George Osborne, the British Chancellor of the Exchequer & MP for Tatton—and no, I don’t have any idea what that means, either—it shows him, director J.J. Abrams, Lucasfilm president Kathleen Kennedy, and a little dude you might recognize, we like to call him R2-D2. This isn’t the first time that the sassy droid has shown up posing with key behind the scenes players. Now that J.J. Abrams’ Star Wars: Episode VII has an official cast and is actually filming in the deserts around Abu Dhabi, speculation and wonder has turned from who the hell will be in this movie to who the hell will be the main character and what will the story be? 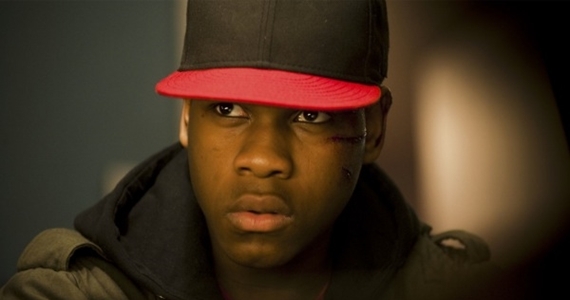 The latest rumor says the main focus of the new adventure in that far, far away galaxy, will be Attack the Block star John Boyega. Director J.J. Abrams’ penchant for secrecy is well established at this point. And honestly, I admire him for trying to keep some of his secrets secret until they hit the screen. Sometimes it gets a little silly, however, as seen during the months-long, ridiculous campaign of denial about the whole Benedict Cumberbatch/Khan thing — it was a secret that didn’t really add anything for new Trek fans who weren’t as familiar with the character’s history, and for those who were, it was obvious what was coming long before Star Trek Into Darkness hit theaters. Well, perhaps Abrams learned a few things from that experience, because he just gave the perfect response to the glut of set pictures leaking from Star Wars: Episode VII. Check out the tweet from Abrams’ Bad Robot up top.